Most Americans oppose Trump's foreign policy - Integration Through Media ....! DEB RIECHMANN and HANNAH FINGERHUT, WASHINGTON, (AP) – A majority of Americans disapprove of the way President Donald Trump is handling U.S. foreign policy and about half think the country’s global standing will deteriorate during the next year, according to new poll that highlighted the nation’s partisan divide on foreign issues. 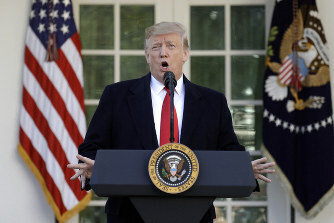 The poll, conducted by Associated Press-NORC Center for Public Affairs Research, also found the public split about the president’s plan to remove U.S. troops from Syria and possibly Afghanistan – and about a quarter don’t have an opinion one way or the other. Overall, the president receives low marks from the public for his job handling foreign policy – 35 percent approve, while 63 percent disapprove. Like other issues, the partisan divide is startling. While 76 percent of Republicans approve, just 8 percent of Democrats say the same. “I just think that any time you buddy up with Russia or North Korea, it’s going to be bad business,” said Samantha Flowers, a 30-year-old third-grade teacher from Columbia, Missouri. “I think he’s doing a good job with North Korea. He’s done better than anybody else has ever done. Nobody else has even got it this far with North Korea,” he said referring to Trump’s meeting last year in Singapore with the North Korean leader to discuss Pyongyang’s nuclear weapons program. Turing to U.S. involvement in foreign wars, the poll showed 39 percent of Americans approve of pulling the 2,000 American troops from Syria, and 35 percent say they disapprove. The president’s decision is supported by 56 percent of Republicans and 26 percent of Democrats. Last month, Trump announced that Islamic State militants had been defeated in Syria and that American troops would be brought home “now.” The plan triggered the resignation of Defense Secretary Jim Mattis and criticism from U.S. allies and national security experts. Later, Trump and others appeared to adjust the timeline, saying it will likely take several months to safely withdraw American forces from Syria. Americans have similar views about the president’s expected decision to pull at least some U.S. troops out of Afghanistan. Forty-one percent said they would approve of a pullout from Afghanistan versus 30 percent who disapprove. The nation’s partisan divide is evident when it comes to Americans’ views of the United States’ role in the world, its global standing and its relationships with other nations. Democrats are far more likely than Republicans to say the U.S. should play a more active role in solving the world’s problems. Forty-three percent of Democrats think the U.S. should be more active, compared with 23 percent who think it should be less active; another 32 percent of Democrats say the nation’s current role is about right. Republicans see it differently. Four in 10 Republicans say the U.S. should be less active in solving the world’s problems, while 46 percent think the current role in world affairs is right. Just 13 percent of Republicans think the U.S. role abroad should be more active. Republicans also think the nation’s global standing and relationships with other countries will improve or stay the same during the next year. Democrats largely expect U.S. relations with other nations will worsen. Forty-four percent of Republicans say the nation’s standing in the world will improve and another 35 percent say it won’t change. By comparison, 77 percent of Democrats think the country’s global standing will get worse. – Fifty-five percent of Americans consider militant extremist groups to be very or extremely concerning, with another 29 percent calling the threat moderately concerning. – About half say they are significantly concerned over the threats of North Korea’s nuclear program (52 percent) and Iran’s nuclear program (48 percent). – While nearly half of Americans – 47 percent – consider Russia’s influence around the world to be extremely or very concerning, slightly fewer – 40 percent – say the same of China’s influence around the world. Still, most consider both countries’ influence around the world to be at least moderately concerning.